You may purchase our printed "How-To" construction booklet titled BOATBUILDING with PLYWOOD and EPOXY [hard copy] through our on-line store [see the link at the bottom of this page]. 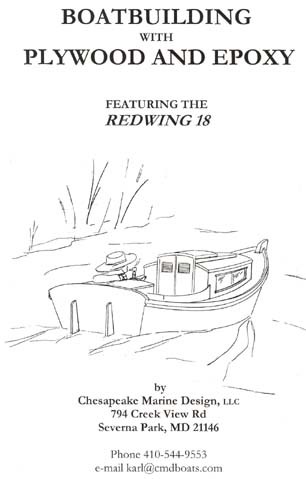 REDWING 18 FOR SALE - Complete boat, built as part of a how-to article for WoodenBoat Magazine [DOWNLOAD PDF description/photos]. Purchase the BOATBUILDING with PLYWOOD and EPOXY BOOKLET for $20.00 for delivery by US Postal Service.